OLD PARKED CARS. : 1978 Pontiac LeMans. I have always disliked these General Motors (A) body cars from 1978-81. From what I know the back door window does not come down. Instead the third window behind the door is used for ventilation. It is a popout window. 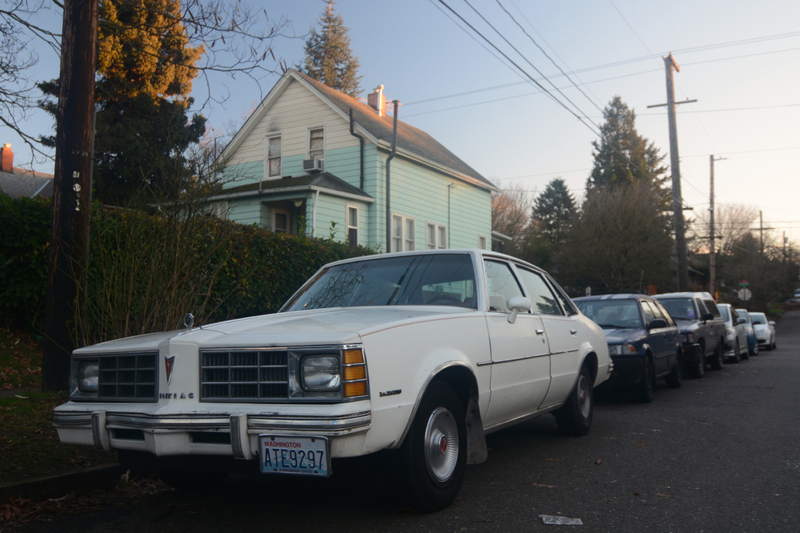 I must admit though if it boiled down to this car or it's sibling the Chevy Malibu, I would take the Pontiac. Now that I think about it I'm surprised the Pontiacs didn't sell better than the Chevrolets. The Pontiac has much nicer styling on both the taillights and front end as well. I would like to add in as well… The first picture has a house in the background it appears to be a two-tone house with the colors green and white. I really like it. Nowadays I'm finding more and more houses in my area NY/NJ painted with earth colors (gray, brown,tan exc) just like the new cars. Ha Ha! Love the "hood ornament" on the old toyota wagon behind it! The car is forgettable, but this set of photos is cool...love the light and perspective. Thanks Frank, I wondered if that detail (which I didn't adequately enjoy at the time) would be noticed. Richard- You're absolutly right about the rear door windows, they were sealed in place, with only the C-pillar vents for rear seat passengers. 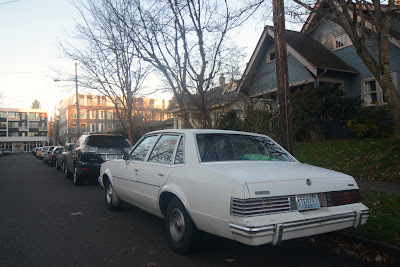 GM had intended to use this "feature" on the upcoming X-body (Citation, Skylark et al) 4 doors but they were so unpopular on the A-body's that they were redesigned at the last minute. Chrysler's first year K-cars had them as well but they were swiftly redesigned for the following year, yet GM kept them on the A-body cars right til the end. I generally lean towards Buicks (hence my SN) but always liked the Pontiac version of these as well...as a two door coupe, with the 301 4bbl engine it would be a nice street cruiser. A Grand Am would be even better but good luck finding one! Agreed also on the boring appearence of "new style" houses they are every bit as repetitive and uninspiring as the late model cars. We seem to have lost our sense of aesthetics somewhere along the way....a pity, that. Happy New Year to OPCers far and near. a worthy opc. bread and butter right here. 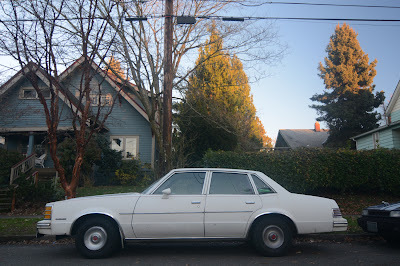 knowing nothing, i appreciated that rear quarter-window as a funny little anachronism and was going to comment on it. but when i read richard and roadmaster's comments, i actually got stressed out claustrophobic. god, how stupid could a design team be to think people would accept a car with a fixed passenger's window? i'm dying to know the nitty-gritty command chain details with the name of every gm executive and designer who signed off on that one. One of GM's finest late-malaise era offerings.